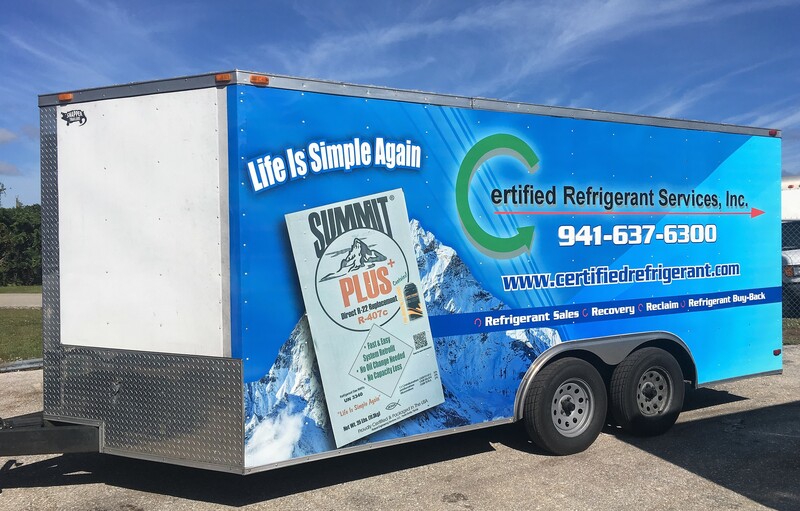 Certified Refrigerant Services Process & Return program is designed to reclaim your used R-22 and return it to ARI-700 purity so it can be returned to service. This process helps assure that R-22 will be available going forward. Step 1: 1-2 days before your route day, we will send you an email requesting the number of tanks you wish to swap. Step 2: On your regular route day, we will pick up your used R-22 in recovery cylinders and deliver an equal number of empty recovery cylinders. Step 3: Certified Refrigerant Services will empty your cylinders, test the contents for purity and weight, and reclaim the used gas. R-22 above 99.5% purity will be processed, R-22 below this purity will be purchased. We use a 10% loss factor for oil and non-condensables. Optional Step: If your company uses PO’s, our staff will email a copy of the invoice and request a PO#. Step 4: On your next scheduled visit, we will deliver clean, ARI-700 certified R-22 gas in disposable 30# cylinders. You will be billed per pound and an invoice will be included with your delivery. Note: Please call 941-637-6300 or Contact Us for current pricing. We will swap your initially provided cylinders with our stock cylinders that we keep serviced, painted and within proper DOT certification. Should you only want to only use your own cylinders, an adequate number of cylinders must be available to insure that you don’t run short.